With so many events to enjoy you won't want to miss out on all that Geneva Event Centre has to offer. Attend a conference or a community social. See a live show or band and enjoy a variety of adult refreshments. Experience great entertainment right downtown Orillia. If you wish to book an event please call us or provide your event information on our reserve page. Seating Arrangements: Seating is at a first come first serve basis. Please arrive early for best seats. Ticket Sales: Online tickets will be sent via email and never mailed. This is the Repair Cafe motto. At this pop up event, people are invited to bring items that are broken or need mending and volunteer "fixers" will work with you to try to repair that item. You can also drop in just to say hello and to observe. 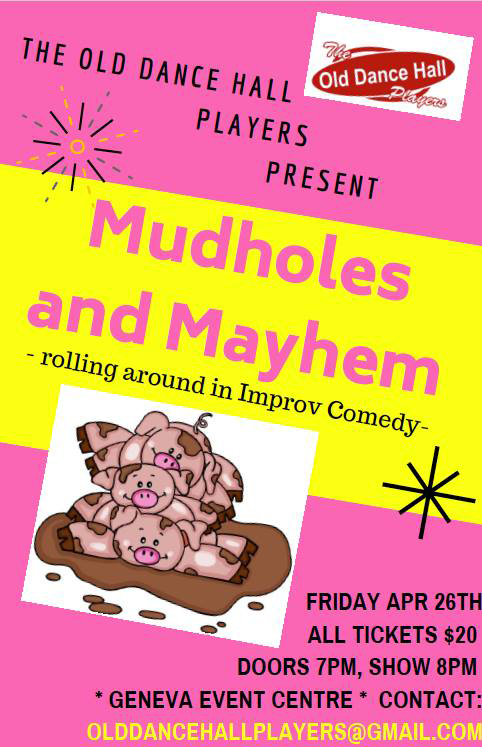 Please join us for this unique community building event! There is no cost to attend, but goodwill donations are accepted. Light refreshments provided. No appointment necessary. Children are welcome. 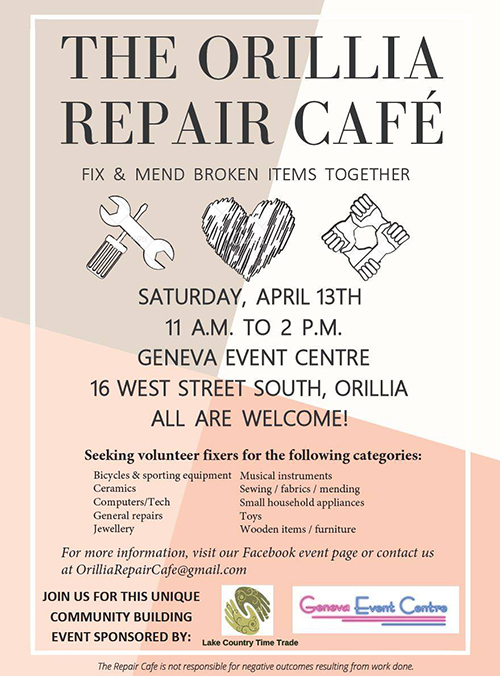 Contact us at OrilliaRepairCafe@gmail.com to let us know if you can volunteer. Transportation to the event can be arranged if request is made to OrilliaRepairCafe@gmail.com prior to April 10th. This Show Is Not Censored. Discretion Is Advised. With a huge afro, Adrienne Fish has been making her mark on Canada's comedy scene. Based out of Toronto, Adrienne has recorded four nationally aired TV tapings, has appeared on CBC's The Debaters, and was most recently nominated for a Canadian Comedy Award. Note: Shows usually sell out, so don't hesitate for tickets. See you there! A big hit last year! 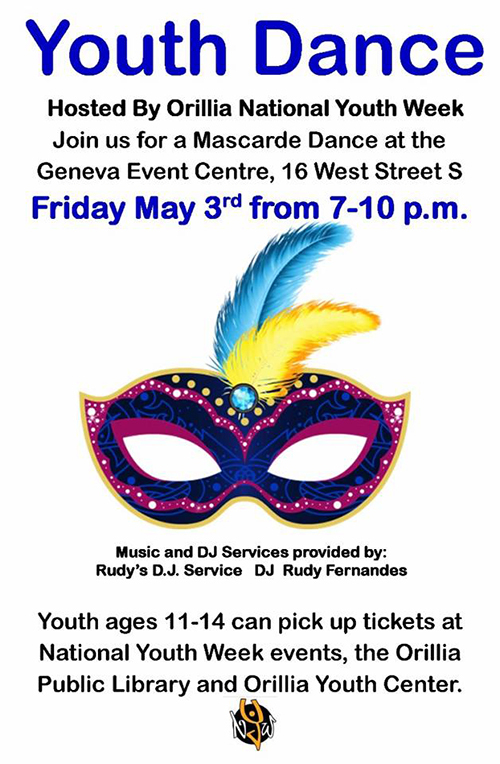 We are so excited to once again be working with the Geneva Event Centre and Rudy's D.J. Service to host a Youth Dance on Friday May 3 from 7:00pm - 10:00pm. Tickets can be picked up at the various events taking place during Orillia National Youth Week or onsite at the Orillia Public Library Teens and Orillia Youth Centre. Please attend last year was EPIC! Tickets only $10.00 right now and are available through Kim, or myself. Message us privately on Facebook or call us, as it is FIRST COME, FIRST SERVE. Only 250 tickets available! Tickets SOLD OUT in 15 days last year! Don't miss out on one of Canada's top Rush tribute bands. MFH performs the music of Rush from all eras. A truly authentic Rush experience!